Tips and Tricks to Help You Go Out And Find GOLD! Experts agree that only a small percentage of the Earth's gold has been found. There is still TONS of gold out there waiting to be discovered. Our new 65-page eBook helps you learn how to do it! This eBook provides the foundation that every gold prospector should have. Follow the advice and principles found in this report and you will be well on your way to joining a group of miners who are consistently finding gold! We are confident that this eBook will help you in your search for gold. If for any reason you are not satisfied, we will gladly give you a full refund. No questions. We offer this 30-day guarantee because we know that the contents of this ebook will make you a better gold prospector! Searching for gold is truly one of the last great adventures there is. And with the high price of gold today, there really is no better time to go out and find it! 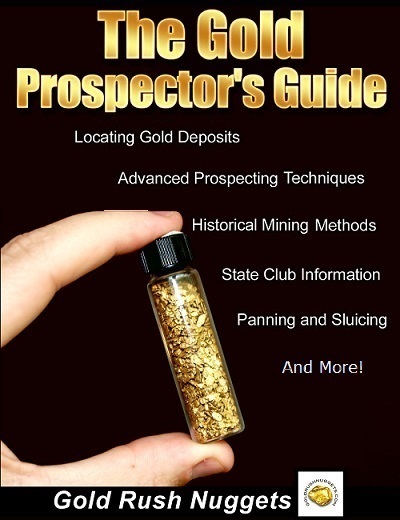 *The Gold Prospector's Guide eBook will automatically be emailed to you as a printable PDF after purchase. No waiting and no shipping charges.